While Team Fortress 2 is now a free to play game (thanks, Valve!) and shouldn’t be missed by any self-respecting player, Eric Ruth decided to work is magic on this game and created Team Fortress Arcade. The maker of Pixel Force: Halo strikes back with a fun and fast paced side-scrolling action game based on the amazing characters and universe imagined by Valve. The pixel art design is in sync with previous works from the same author, offering a visual charm that seems straight out of the NES or Megadrive consoles. 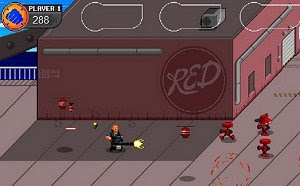 The player joins the blue team and uses the Heavy, Pyro, Spy and some others to defeat the red team. A co-op mode for up to 4 players turns the fun up to eleven, adding mayhem to the already compelling gameplay. The author notes that an online multiplayer option is in the cards, although for now we’ll have to settle for local co-op only. This is a freeware game and doesn’t require any kind of connection to Steam to play, so just download and enjoy!